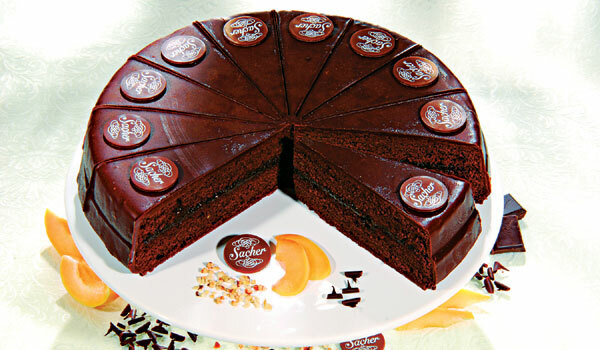 RECENTLY returned from a trip to Vienna hand-carrying a precious package all the way back: two piccolo-sized Sacher torte, the delicious apricot jam-laced intensely dark chocolate cake invented in Vienna. Beautifully packed in individual white wooden boxes by the Hotel Sacher bakery from where it originated, it felt good bringing back a slice of my visit home to taste. This isna��t the first time. Over several years, Ia��ve carried back some beloved iconic foods from various holidays: black truffle Pecorino from Pienza in Italy, bratwurst sausage from Munich, pungent artisanal extra virgin olive oil from Haro, Spain and macarons from Fauchon and rich, creamy foie gras and terrines from France, dark chocolate from Neuhaus and FrA�dA�ric Blondeel in Belgium, biscuits roses de Reims from Champagne, and cheeses galore from their places of origin a�� Spain, Italy, France and England. And of course, wines of the regions. This time, a bottle of Zweigelt by a young boutique winemaker in Kamptal in Austria. Ia��m not alone. Several people I know enjoy bringing an (literally) edible slice of their holidays back, where they can savour these again at home and recall those special times. To me, ita��s better than putting vacation photos on Facebook. So why bring back a bottle of Rioja wine when a mantilla shawl is prettier and less troublesome to transport? For a foodie, this question is a non sequitur. When I taste something I love, I enjoy sharing it. The holiday memories become more real, the feelings they bring back more vivid, and the happy memories more easily spread around. Rivera restauranta��s chef-owner John Sedlar of Eloisa, found his eureka moment when he tasted black mint or wakatay during a trip to Peru. He brought it back and now uses it in his signature dish of sautA�ed sweetbreads back home in the US. a�?Incredibly strong aromatics, unforgettable,a�? he says. Arjun Sajnani should also know. His restaurant Sunnya��s is built in part on food memories of days spent in New York years ago. When I asked him, he said, a�?Therea��s something about food that makes special memories. When you eat that food again at home, those good thoughts are rekindled.a�? Having eaten particularly memorable pasta with fresh truffle in New York, he said he opts to bring back fresh truffles a�?to make, as a total indulgence a truffle risotto or creamy truffle pasta.a�? Home chef Anna Minocher recalls several wonderful food memories from her travels. a�?There are the pickled herrings from Sweden which I tasted at my familya��s home in Sigtuna. I always ask for some if someone is travelling back from there. Ia��ll also never forget the Christmas pudding from Fortnum & Masona��s London, which I once brought back home, along with the lovely special Christmas chutneys and preserves that filled the shelves at the time. And rumtopf, the preserved fruits of the season in liquor, which is eaten as dessert with ice cream or cream in Germany. I saw this done in beautiful ceramic jars in a frienda��s kitchen there, and thata��s something Ia��ll never forget.a�?